The BFS-201 filter systems are shipped completely pre-assembled. Water filters are sold separately, which allows you to purchase the best water filters for your water supply. The BFS-201 Water Filter System includes two number 10 Slim-Line housings with a 3/8-inch inlet/outlet. The Pentek BFS-201 multiple housing system includes wall mounting bracket and hardware. The BFS-201 water filtration system has a pressure relief button to relieve housing pressure when replacing the water filter cartridges. Leaking is prevented by the dynamically sealing O-Ring. The O-Ring should be replaced periodically to prevent leaks. 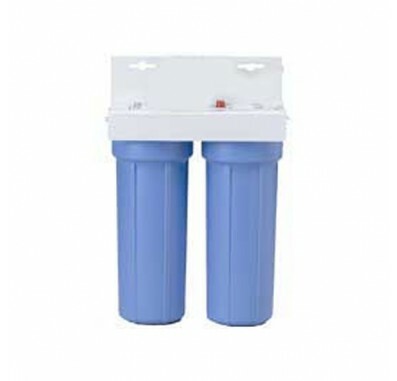 BFS-201 Filtration System Filter Cartridges: The first housing is best used for sediment reduction. The second housing is best used for a carbon filter to improve taste and odor and reduce additional contaminants. By installing the sediment filter first, the carbon filter will last longer because it does not get clogged with sediment. Since carbon filters are more expensive, it is better to have the sediment filter first that needs to be replaced more often. The water filter cartridges are not included with the housing. This allows you to purchase the best water filter for your water supply. Sediment water filters reduce dirt, sand, silt, sediment, rust particles, and scale particles. Choose from one of our sediment water filters at the 10" x 2.5" Water Filter Page. Drinking water filters produce healthier, better-tasting drinking water by reducing chlorine taste and odor and other contaminants. Choose from one of our carbon drinking water filters at the 10" x 2.5" Water Filter Page. Replacement OR-38 O-Rings. Two o-rings are included with the housing purchase, but you should replace the o-rings periodically to prevent leaks. Use the SW-1 housing wrench to remove the sumps. The wrench should NOT be used to tighten the sumps back onto the cap. Tightening may cause damage to the o-rings.